SCANIA'S most powerful V8 engines have found a welcome home below the decks of one very classy cruiser. Scania has been selected to provide a pair of 900hp V8 Marine engines to power a new Motor Cruising Yacht, owned by the founder of Maritimo, Bill Barry-Cotter. Trucking journalists usually get invited to truck launches around the country but when Scania organised their recent media conference it included a ride on the $3 million pleasure cruiser. The power of the boat was impressive, we started at Sanctuary Cove went out past some amazing luxary water front properties then the throttle was opened, wind and spray through our hair as we headed towards Couran Cove on Stradbroke's south Island. We stopped for lunch up past the cove, but it wasn't sandwiches and juice, the yacht features a kitchen and so a private chef whipped us up some lunch. Overlooking blue waters and white sand we dined and when lunch was over we headed back to the Gold Coast. We're told the new Scania engine gave the boat a bigger range, we didn't test that on the day but it certainly was a joy to feel the boat glide through the water. Maritimo is Australia's leading luxury boat builder, currently well into a growth spurt, Maritimo is continuing to expand both its product development program and its distribution network around the world. Mr Barry-Cotter is an icon of Australian luxury boat building, and his company's portfolio now covers 12 separate models across thre different lines - Cruising Motor Yachts, Sedan Cruisers and Mustang Sport Yachts. 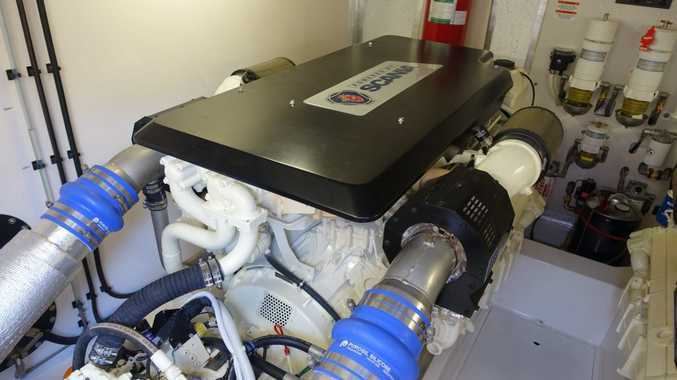 So his selection of the most powerful Scania marine engine offered in Australia is recognition of the many appealing attributes of the engine range, not least of which is the high performance and fuel efficiency. The Scania engines will be fitted into the new M65 design vessel, the first five of which were commissioned without a single example having been put into the water. The M65 had its public debut at Australia's premier boat show, the Sanctuary Cove International Boat Show in May 2015. "This is a serious motor yacht and the interest we have had in this new model has been tremendous," says Maritimo's Sales and Marketing Manager, Greg Haines. "The vessels we have started building will be set up primarily for both cruising and fishing pursuits and all have been ordered with Seakeeper gyro stabilizers. "These boats start from $2.865 million and are optioned up from there." Mr Haines says Maritimo's super efficient shaft-drive and hull design technology delivers superior fuel consumption figures compared with its competitors using pod-drives. Maritimo expects that with fuel capacity of 6,300-litres the M65 will have a range of around 450 nautical miles at a speed of 21-22 knots. 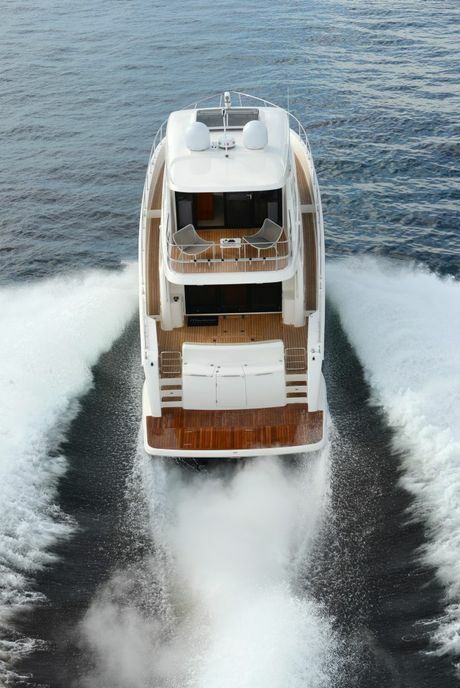 The M65 has four main cabins including a full beam master and full beam en suite. A substantial galley offers the option of side-by-side domestic-sized refrigerators. Mièle appliances are standard. 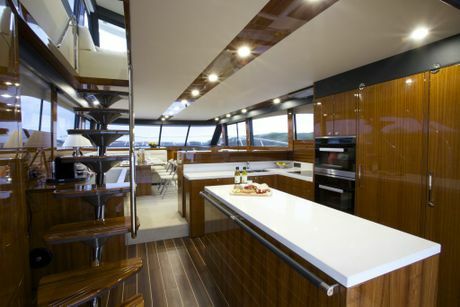 The saloon lounge is three metres long and the flybridge is larger than the saloons on most other boats. 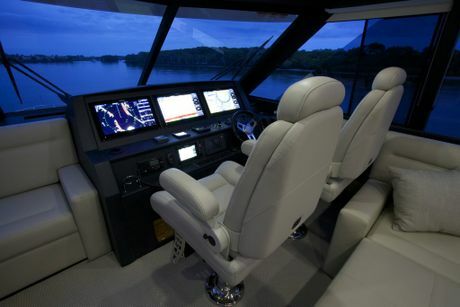 "The flybridge is really like the second storey of an apartment. It is massive and can be used for additional sleeping quarters or entertaining," Greg says. Regarding the selection of Scania engines, the lengthy 500 hours service interval has been identified as a significant element in the decision-making process for the Maritimo founder, as well as the simplicity of the servicing task, which requires far fewer components be replaced, saving time and money. Even for owners of boats worth close to $3 million, running and servicing costs are still a consideration. "Scania Engines are very reliable and have low running costs," says André Arm, Scania Australia's National Manager for the Marine & Industrial Engines division. "This fact has not escaped Bill Barry-Cotter who has studied our servicing requirements as much as our impressive power and performance statistics and our fuel efficiency projections. "With his commitment to shaft-drive coupled with the hull design, we are confident this vessel will return excellent fuel consumption figures, providing enhanced cruising distances and reduced running costs. "Traditionally, Scania has been highly regarded in the work boat market. Demand for our engines continues to grow," André says. "We have long maintained that our modular design, robust construction and proven longevity makes Scania engines the perfect match for the needs of pleasure boat builders just as much as for builders of working boats. "As such we are delighted that an Australian boat builder of the stature of Bill Barry- Cotter has selected our pinnacle engines to power his personal vessel," André says.